Thanks for giving me an award News From Aspen Meadows , Grey Horse Matters , Dressage On The Quarter and Megan and Scarface ! I really appreciate it and enjoy reading your blogs. There are lots more blogs I read and love. Check out my sidebar for a few of them. I'll be adding more in the near future. I'm kind of obsessed with dressage. I guess you know this. I put everything I have into it - time and money and energy. I organize my life around getting more dressage related activity. I drive a smart car. There, that's it! Thanks again for my award and for reading. I also would like to go camping with my horse. My family used to go camping when I was younger, I remember having so much fun. How much more fun would it be with the horse, all the trail riding!!! Let's see, we share numbers 1, 3, 4, 5, 6 & 7. I guess we have a little bit in common. Christine, that's funny :) You guessed I like dressage? Annette that's uncanny. Even the same car! Wow! Horse camping is the best! I have even done it with my cooky TB so I imagine your horses would do great! I am honored Carol! Thank you - I enjoy your blog and esp loved the posts when you went to dressage camp. That is on my list of things to do within the next couple of years. Carol, Thank you so much for the award! I am honored to receive it. It is interesting to read little tidbits about each other. Like your smart car. What exactly is that? Is it an electric car? And it is interesting to know how much you like cooking! Great to get to know more about you. I will answer same about myself soon. 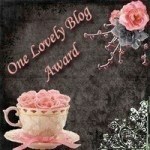 Thank you again- your blog is one of my top favorites all the time!